These days when you leave a conference or convention, the first thing you discard is your name badge. Who wants to be caught with a lariat around their neck or a big card pinned to their chest displaying their name? Not so, 100 years ago. Convention goers would be decked out with pins, pinbacks, ribbons and watch fobs to commemorate their attendance at an event. Often well made, these pieces of ephemera have stood the test of time and help us image the life of a conventioneer in Los Angeles over a century ago. 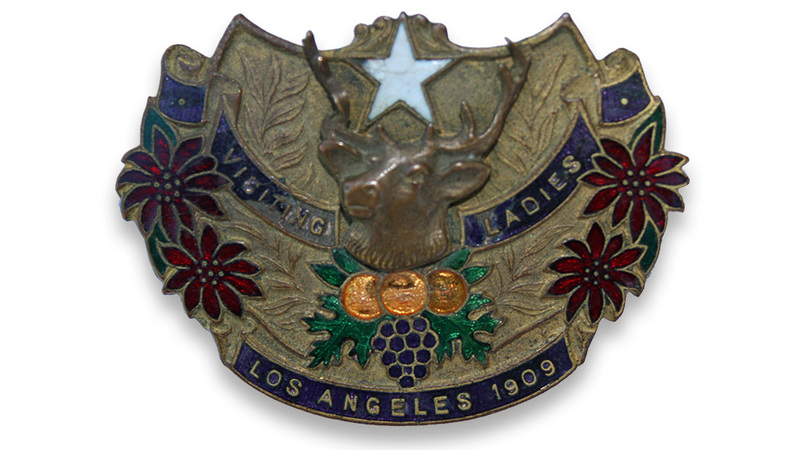 The discovery of a “Visiting Ladies, Los Angeles 1909, pin with an elk head on it was a tip off that this pin would have adorned the dress of women who accompanied men attending the Fraternal Order of the Elks 1909 convention in Los Angeles. The convention was hosted by Elks Lodge No. 99, located in downtown Los Angeles. What a convention this was! Thousands of people came in by special trains from across the country. Delegations from other states spent thousands of dollars to adorn floats for the grand parade, representing their home state lodges. The parade would rival the Rose parade. Some delegates even endured a long sea voyage to attend- the five delegates from the Philippines, representing the 500 members of the Elks in Manila, were lauded for traveling the furthest. The conventioneers traveled throughout the region seeing the sites the Los Angeles region had to offer. A “Long Beach Day” during the convention boasted the largest crowd ever in that city- 35,000. Three and four car trains were leaving Los Angeles every three to four minutes to head to Long Beach. By noon, all the bathing suits to rent were gone as 5000 people played in the surf. Everyone proudly wore their badges and badge-swapping between lodge members was in full swing. Fortunately for the Elks Lodge No. 99, their building or “temple” was directly adjacent to the Los Angeles Incline Railway, also known as Angel’s Flight. A passenger record was set during the one week convention that began on July 11th and ended on July 17th - Angel’s Flight handled 60,000 passengers that week. Figure 1. The Crocker Mansion at the top of the Bunker Hill served as an annex for the Elks Lodge No. 99 whose main building was just below the Mansion. By late 1908, the Crocker Mansion was gone and construction had started on its replacement. The new Elks building opened in May, 1909, just in the time for the convention. The Elks had both a main building and an annex. The annex was the old Crocker Mansion, at the corner of Olive and Third Street, the former stately home of the Crocker banking family. The structural issues associated with the building had been known for some time and the Elks purchased the building for $65,000, aware of its faults. About a year before the convention, the Elks hoped to remodel the building but engineers advised them to tear the mansion down and build a concrete-reinforced structure. Figure 2. The new Elks Building built at the site of the Crocker Mansion, Photo from Department of Water and Power Associates. Figure 3. A postcard showing the lower Train and William’s arch at the entrance to Angel’s Flight and the Elks Lodge No. 99 sign towering over the top of the Bunker Hill. Today the letters B. P. O. E. are painted over but still clearly visible. People pass below them every day without having any inkling of the connection to the Elks Lodge No. 99 of Los Angeles. At one time, the letters were painted black so they could be clearly visible. Then, later the depression created by the carved letters was filled in, obliterating them, creating a blank panel. Today, this small bit of Los Angeles history is still visible, although not as prominent as it once was. Figure 4. Angel’s Flight after reopening in September 2017. Many people carried memories of the July 1909 Elks convention, especially the ladies, as witnessed by the number of ladies pins that can be found today. These pins are not particularly rare. For those who wanted a more precious memory of the convention, enterprising Los Angeles jewelers could make them a pin in solid gold! Los Angeles’s Angels Flight by Jim Dawson, page 32. Angel’s Flight by Virginia L. Comer, page 41.